The Melrose range has been one of Carnaby Caravans best sellers for many years so it isn’t surprising that there are nine models in the 2012 line up. We chose the 292B CL for this review, the letters CL denoting that it has a centre lounge. 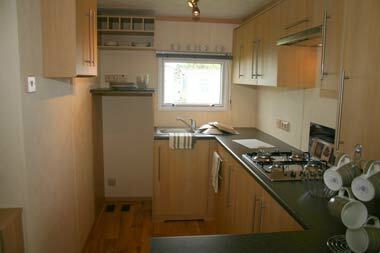 As a result, when we looked at the flank wall at the end of the static caravan, instead of it being a large expanse of windows normally associated with many holiday caravans, in this model the wall was almost fully clad there being only one fairly small window situated above the sink unit in the end kitchen. 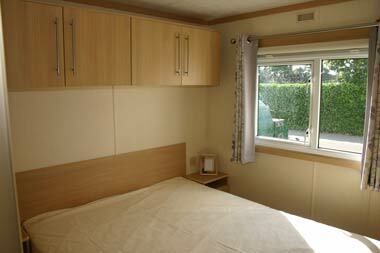 This is a 30ft x 12ft static caravan which comes with UPVC double glazing and wet central heating as standard. Among the options available are a fusion painted or fully galvanised chassis, plastic cladding and environmental colours. All models have a pitched pantile steel roof. The one option which we think should be seriously considered is the fully galvanised chassis, especially if the holiday caravan is to be sited anywhere near the sea as salt corrosion could be a serious hazard. Double doors lead into the centre lounge with the dining area immediately on the left. Opposite the doors is the lounge seating. The layout here is L shaped and includes an occasional sofa bed to increase the sleeping accommodation from four to six. The short leg of the seating is to the right as you face the sofas and runs along the party wall with the caravan’s toilet compartment. 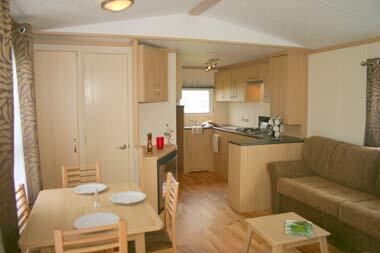 In the corner of the static caravan, adjoining the left-hand end of the sofa, is the kitchen. This we have to report, is fairly basic as far as equipment is concerned having only a four burner hob, an extractor, and a stainless steel circular sink. On the plus side, there are plenty of work surfaces and floor and wall cupboards, together with a dedicated space for a 1300mm high x 570mm wide x 600mm deep fridge. On the wall at high level above the fridge housing, is a five bottle wine rack which we regarded as a nice touch. Opposite the four burner hob is the party wall separating the second bedroom from the kitchen and dining areas. Adjacent to the dining area the party wall makes two right-hand turns to allow the holiday caravan’s electric fire and surround to be fitted. A storage cabinet has been fitted above the fire. The second bedroom is just large enough for two divan beds, each measuring 1.83m x 0.685m with an aisle between them. On the wall behind the beds is a panel headboard, plus a pair of double door wall cupboards at ceiling level, whilst at the foot of the bed on the outside wall is a built-in wardrobe. Although room is small, bearing in mind that this is a holiday caravan, we felt that it was perfectly adequate, especially if being used by children. Diagonally opposite the second bedroom and separated from it by the lounge and dining area, plus the static’s toilet compartment, is the main bedroom which comes complete with a 1.905m x 1.525m double bed. Behind the bed is a panel headboard similar to that in the second bedroom, plus a row of wall cupboards spanning the width of the room at ceiling level. In the corner of the room, opposite the foot of the bed is a large built-in wardrobe. Which just leaves the shower room. This in fact, backs onto the main bedroom, access being via a door to the right of the static’s entrance. Here there is a good size rectangular shower cubicle complete with a thermostatically controlled shower head, and a vanity unit with a built-in ceramic washbasin. 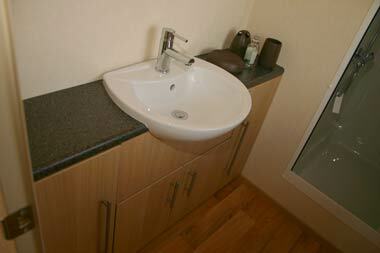 We were pleased to note that the vanity unit has plenty of space for storing toiletries. 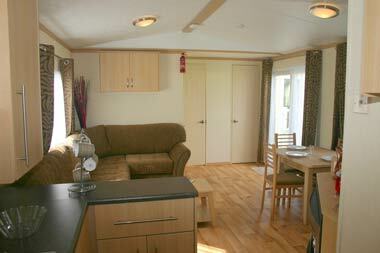 In the holiday caravan only the ceiling in the lounge and dining area is vaulted, the remainder being level. 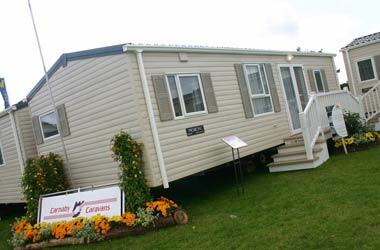 Being at the lower end of the holiday caravan market the Melrose does not have the space or luxury of a high end model, but it will we believe, provide many years of happy holidays for its owners, and with the lack of windows in the flank wall will stand out from similar holiday caravans. Have seen vans in Europe like this. I prefer our UK vans because I think it is better to have bedrooms at one end for more privacy and I like to have a view from the lounge window. Sorry but this design is not for me.